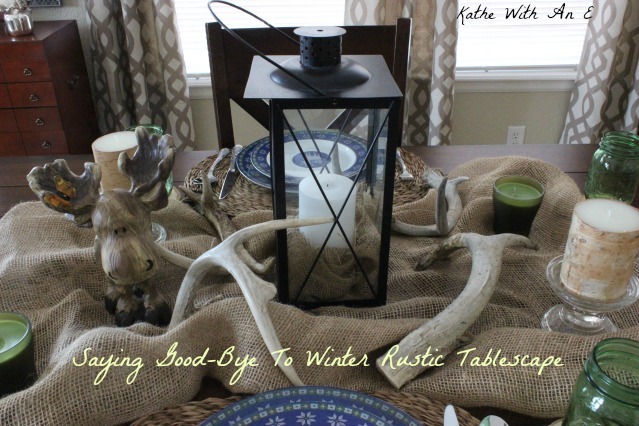 With Spring just days away and all of us being just sick to death with this winter we have been dealing with, I set a table specifically to say Buh-Bye to Old Man Winter! I had purchased these plates off of Craiglist last year. I love how they look like they are cross-stitched. 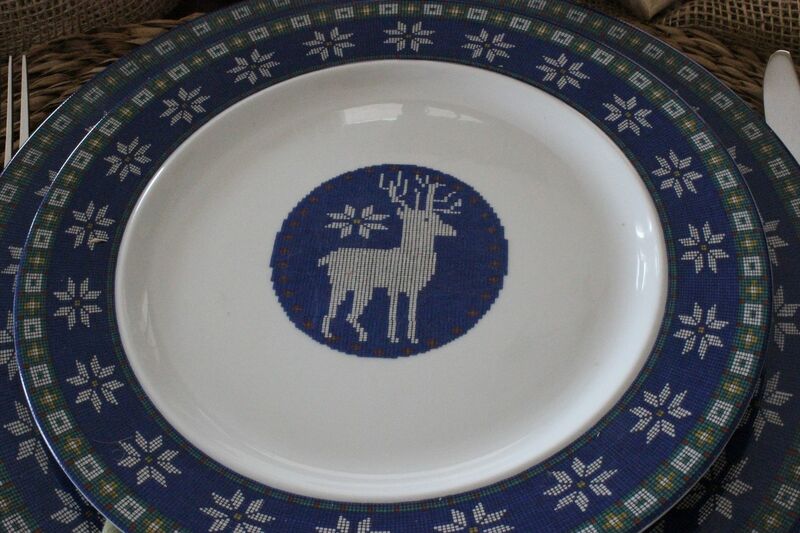 And the deer in the center of the salad plate is...well..dear! 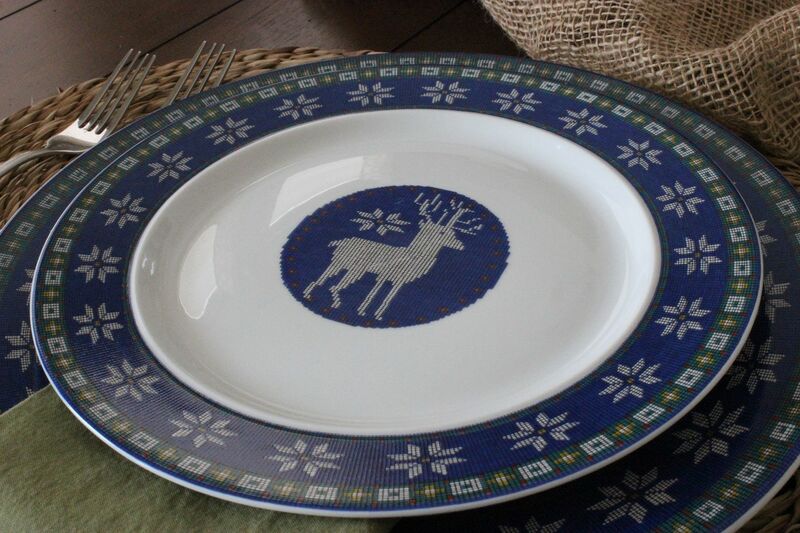 I know I could have used them during the Christmas season, and they would have been perfect, but I saw them more as winter dishes. They came as a set of four dinner and four salad plates. I could have played off of the blue but I decided to use the light touches of green in the plates for some of the accessories, like the napkins and the green ball jars. I had picked up the wooden coasters at World Market over the holidays. 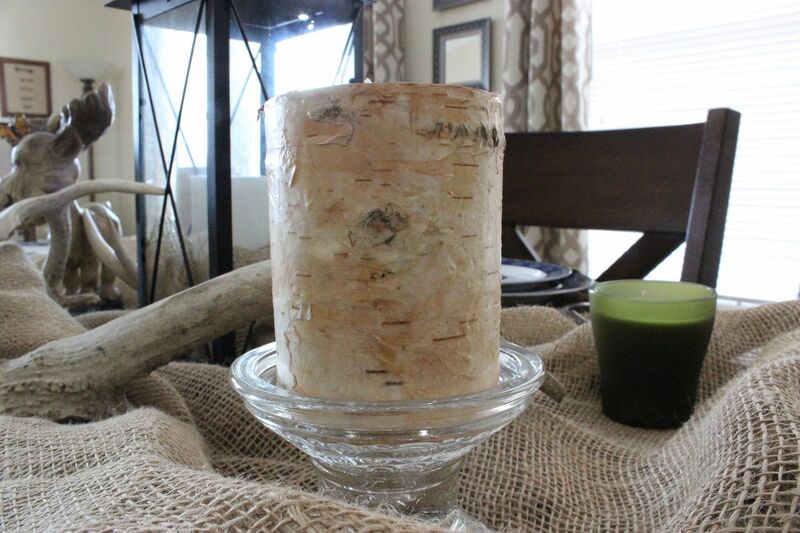 The birch wrapped candles were an after Christmas clearance find. And that sweet moose tooshy you see above? My mother-in-law, Linda, saw it at Lowes and bought it for me for my birthday. 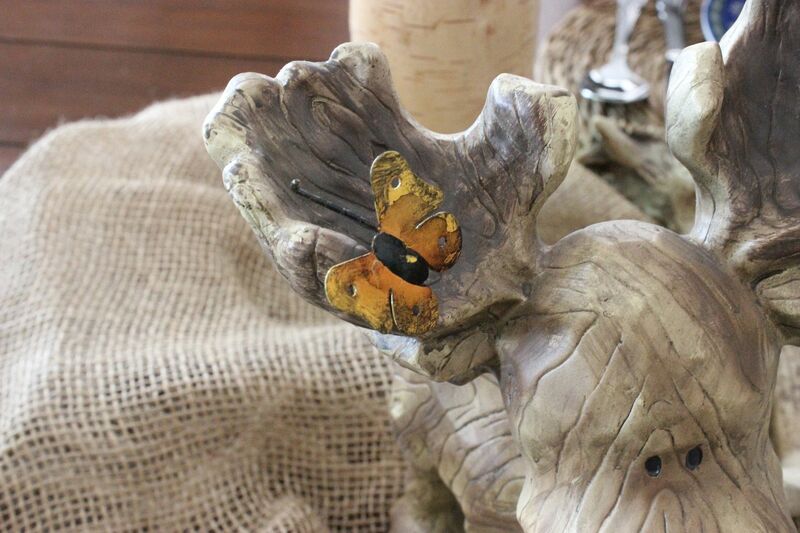 The cute yellow butterfly on his antler surely means Spring IS coming! 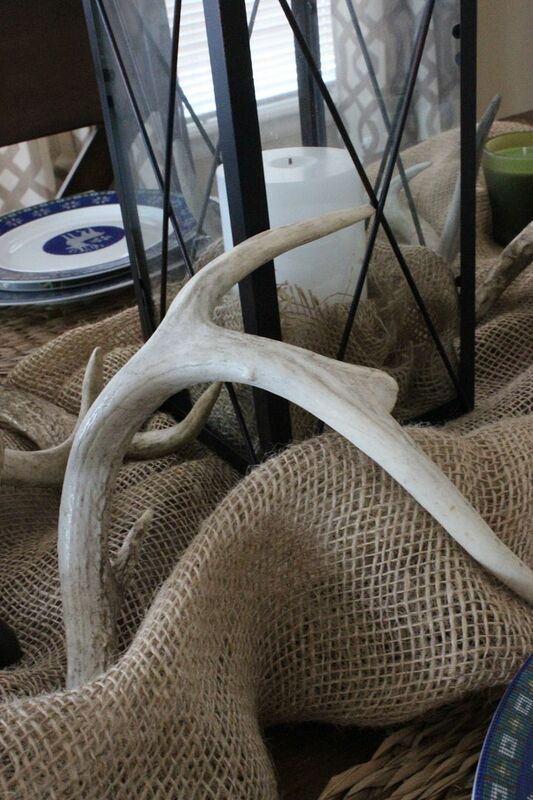 Speaking of birthday gifts and antlers, my dear friend Christine that blogs over at Rustic And Refined knew I had fallen in love with her use of antlers and sent me a beautiful basket filled with burlap, purple mesh and 4 antlers of my very own! 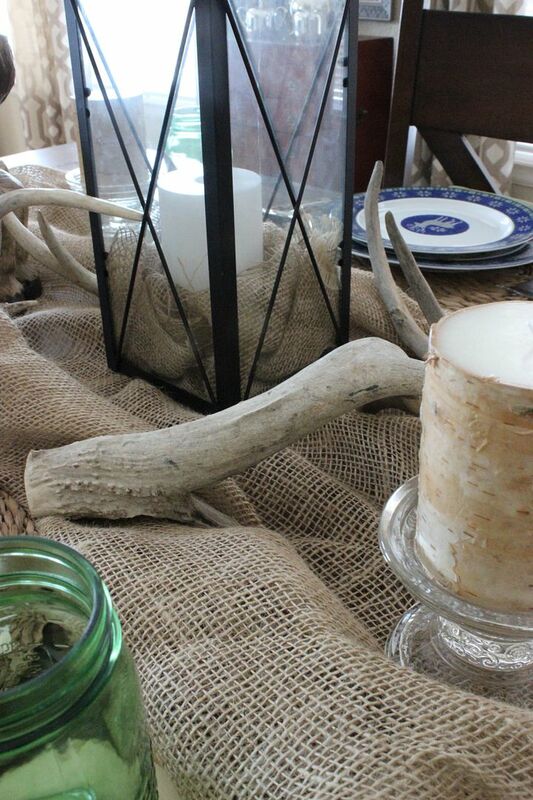 I scrunched up the burlap into a runner for the center of the table and also used some to wrap around a candle in the lantern for the centerpiece. 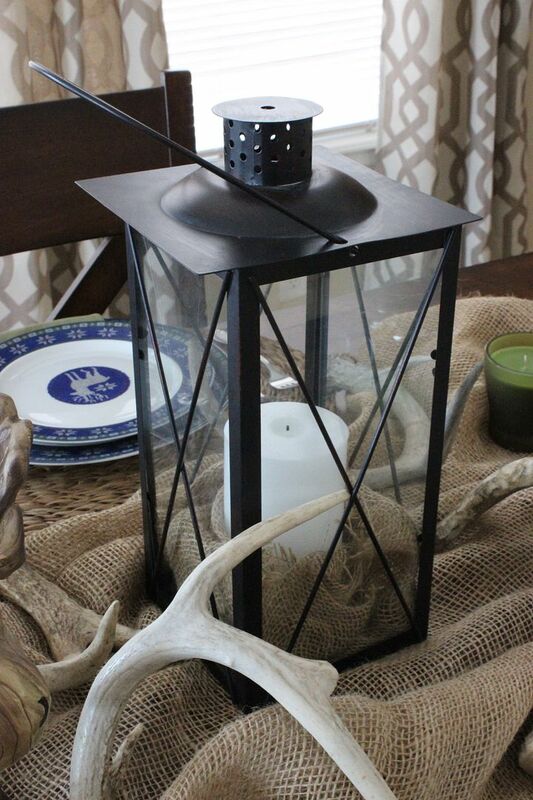 I then lovingly placed the antlers here and there around the lantern. Thank you so much Christine! Look at me! I'm all Rustic and Refined now too! Now that I have set the table to say good-bye to winter, I can't wait to set the next tablescape, Hello Spring!! 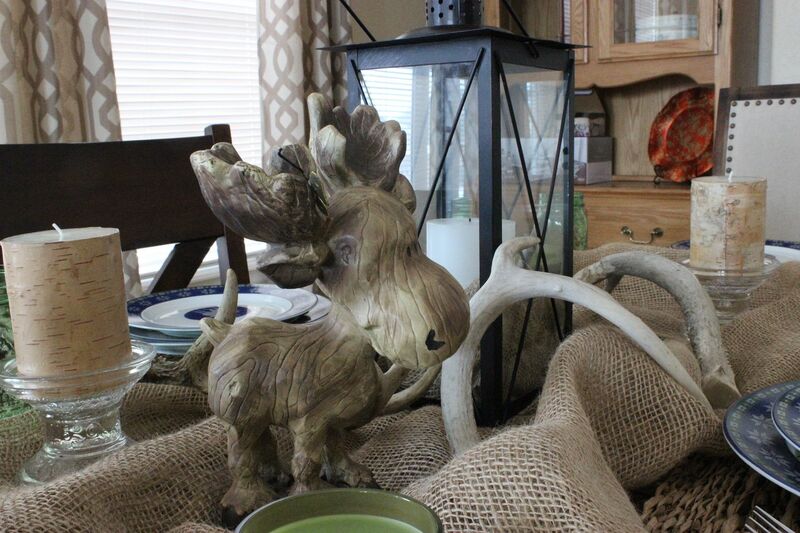 Love the adorable moose and your Craig's list plates. This is cute! 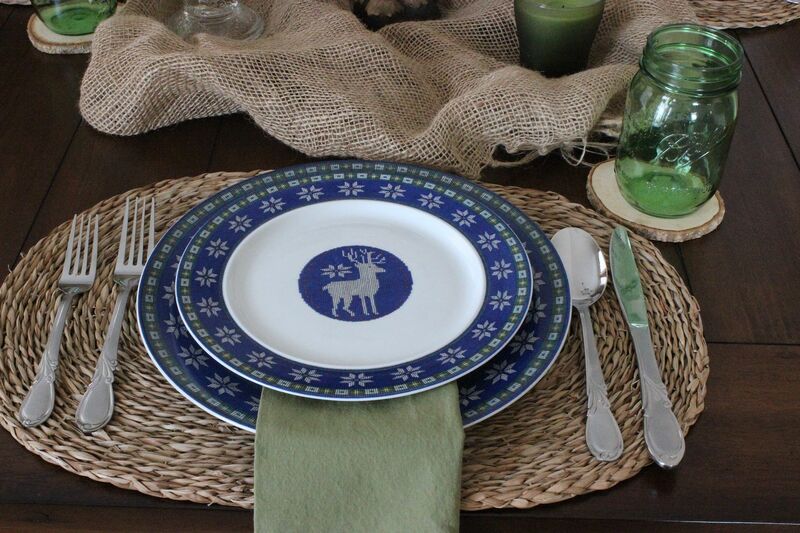 Love the deer on those plates but the moose from your MIL is adorable! I'm ready to say goodbye to winter also! 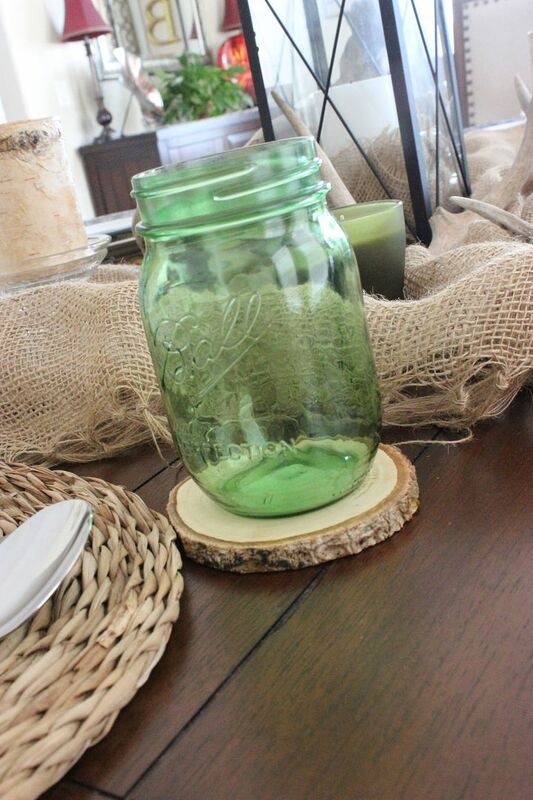 Hi Kathe with an E. I recently discovered tablescaping and have been enjoying the blog posts from Tablescape Thursdays. Everyone is so creative. I really like how you put together this one! Really cute. Sadly we don't have any signs of Spring here yet but I am hopeful! I would love it if you would stop by my blog and join the Something to Talk About blog hop link party! We run Monday's 6am- Thursday! 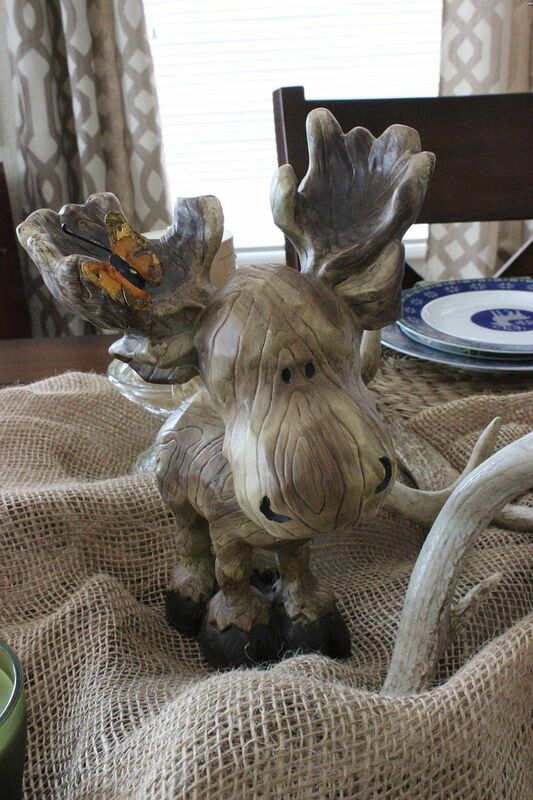 Oh how I love that moose! 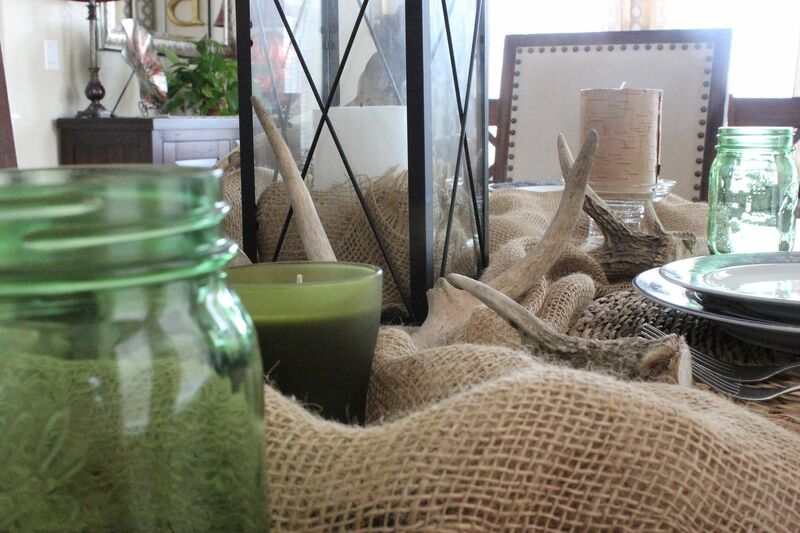 What a great rustic table, I just knew you would do something fun with that basket of goodies! I love the wooden coasters and the antlers. Wish I had some as nice as yours! I also use burlap quite a bit, not sure if I'll be changing that up for spring or not....only a few weeks to go! You set a lovely table Kathe! That was a great Craigslist purchase. They have that winter sweater look. All your accessories go so well with the pacesetting. As for the antlers, do you think I might be able to borrow your friend for a while? I've been looking to purchase some chargers like your coasters. They are fabulously expensive!!!! But I shall not give up the hunt. A bargain is out there waiting for me to find it. 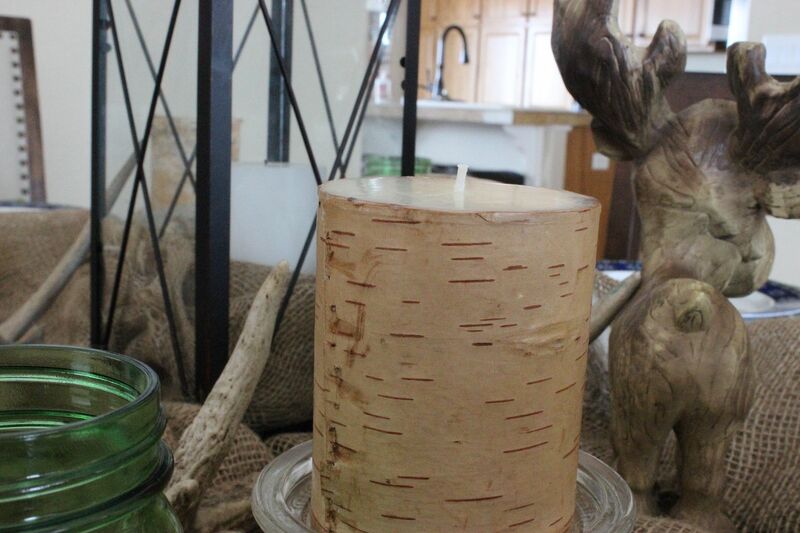 I love your birch wrapped candles. It's good to be excited though! Spring is in the air! I am so glad you liked them, you tablescape is just beautiful! and I am with you...I am so ready for Spring right now, I can hardly wait! Nice decor so well planned out and arranged! I am so ready to say good bye to winter! Very nice Kathe! Yes, let's say goodbye to winter! Thanks for sharing at Home Sweet Home! I sure am ready for spring! We are so glad you shared with us at Merry Monday! We can’t wait to see your creativity next week!